This morning, government regulators in Europe hit Google with a record €2.42 billion fine, roughly the equivalent of $2.7 billion US. The search engine company was found to be manipulating search results to favor its own shopping service, a violation of antitrust laws. And if it doesn’t fix the problem within 90 days it faces an additional €12.5 million fine per day. The ruling has been years in the making, with the European Commission first sending a letter to Google about the matter in 2015. Vestager said that they studied 1.2 billion search inquires before they reached their decision that Google was unfairly manipulating results. Google pushed back in a statement, insisting that the company is simply providing the best service possible to its search engine customers. “When you shop online, you want to find the products you’re looking for quickly and easily. And advertisers want to promote those same products. That’s why Google shows shopping ads, connecting our users with thousands of advertisers, large and small, in ways that are useful for both,” a Google spokesperson said. “We respectfully disagree with the conclusions announced today. We will review the Commission’s decision in detail as we consider an appeal, and we look forward to continuing to make our case,” the statement continued. As just a handful of largely American companies have become global tech monopolies, regulators in the US have done little to deter anticompetitive practices. But that’s not the case in Europe, where governments have taken the lead to ostensibly open up businesses like internet search engines. The most prominent graphic in the EU report shows just how dominant Google is as a search engine. 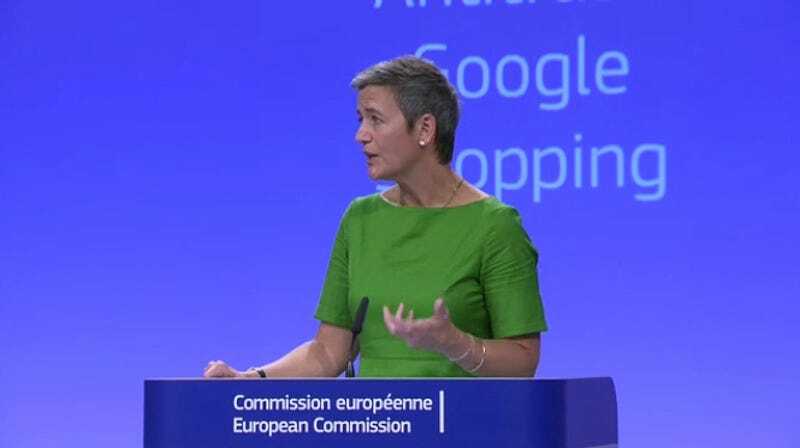 The EU has two other open anti-competitive inquires into Android and search advertising, according to Vestager. There was also discussion of other “verticals” like Google Images being investigated in the future, though it wasn’t immediately clear what that particular service might be investigated for.